The Shakiest Gun in the West. Universal Studios 1968. 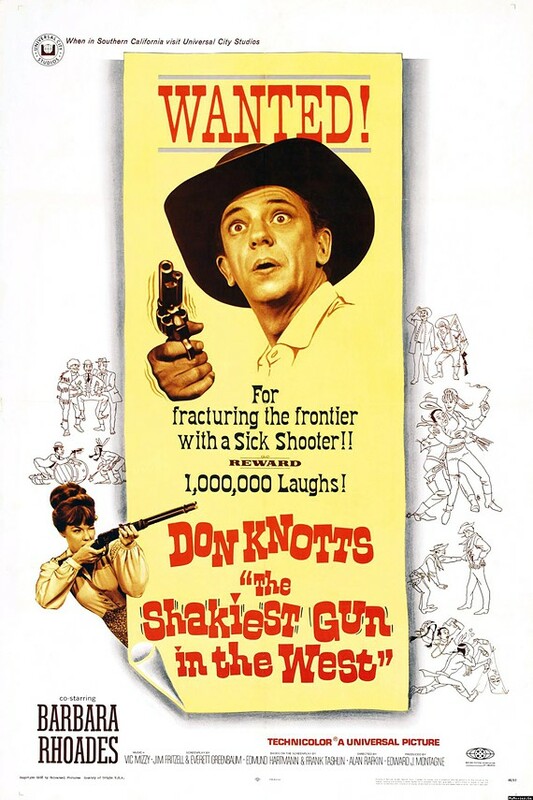 Don Knotts, as Don Knotts a cowardly dentist moved to the Old West. Hilarity ensues. There’s a woman involved. Is more description necessary? Fresh from graduation, Dr. Jesse Haywood, sets out from overcrowded Pennsylvania to be a dentist in the Wild West, a frontier untouched by dental medicine. Stagecoach robber “Bad Penny” Cushings gets arrested and recruited by the federal government to catch some smugglers selling guns to the Indians in exchange for a pardon. When the federal agent who was going to be posing as her husband gets killed by the smugglers, Penny is forced to find a husband in under a day or be barred from the wagon train. The only man she knows heading west alone is the green city slicker dentist who fainted at the sight of her dead “husband”, and she talks him into marrying her right away. However, when they’re set upon by Indians on the way and Penny picks off from the wagon the Indians attacking Jesse, everyone including Jesse is convinced he’s a natural sharpshooter, and the smugglers start to suspect he’s the federal agent tailing them, when he’s actually just a liability with an inflated ego. I think Don Knotts vehicles aren’t good candidates for critical scrutiny. As a protagonist, I didn’t really like that Dr. Haywood is just swept along by the plot until late in the final act, but that’s what the character he always plays does. Knotts is a good reactor, so his plots never focus on him deciding anything until he absolutely has to because he needs to end up a hero. It’s a bit that serves well as an episode of The Andy Griffith Show where he’s supposed to be a loveable sidekick, but as the lead in a film, he doesn’t do much leading. I tried very hard, and I think failed, to write the summary in the previous paragraph so as not to give the impression that Penny is the heroic protagonist and focus of the story. The music was… very familiar. For the first time, I realized that Don Knotts may have a theme that’s following him through his movies. I’m sure I heard that motif before, probably in The Incredible Mr. Limpet, The Reluctant Astronaut, and/or The Ghost and Mr. Chicken. It makes sense to reuse a character theme here, since it’s more or less the same character type in all those movies. While I liked the humor, there were a few moments where they did a show-stopper routine for longer than necessary, almost but not quite to the point where it stopped being funny. Something made the film seem extra long, even though it’s only 100 minutes. Even some of the plot beats seemed to have been elaborated on past necessity. I feel like looking at this movie critically shortchanges this fun little romp. The writing is funny, Knotts’s performance is funny, there’s some good acting from his partner, Barbara Rhodes (who looks really nice in her rough-riding outfit), and it’s altogether enjoyable. It only flops over if you poke at it. Watch this movie: among Western comedies like Wagons East, City Slickers, and Blazing Saddles. Don’t watch this movie: as a great work of cinema like The Good, The Bad, and the Ugly, The Magnificent Seven, and Blazing Saddles.